3-D models may help contractors bring projects to life, but ambitious DIYers are pretty much stuck with Legos, or, if they have embarrassing hand-eye coordination, Duplos. Do like the experts all on your lonesome, with Homestyler. The latest rollout from a company renowned for top-notch architectural design software, Home's a free & easy online interface for building out/visualizing design projects they describe as being "like The Sims without people", so...Sim City? E-building starts with a blank grid and a sidebar tool stocked with structural basics like walls, doors, and windows, and more infrequent deets like fireplaces and stairs, all of which can be resized, dragged, and dropped to create an accurate floorplan you can rotate, view in 2-D or 3-D, and zoom in on; there're separate tools to roll out landscape & outdoor projects as well, including patios, decks, pools, and ponds, aka gross pools. Once the major structural elements are set you can start getting specific, adding major appliances (stoves, fridges, microwaves...), all manner of furniture, flooring, lighting, and electronics, each sized to scale in a range of dimensions, but not the fourth one, cause Carl Sagan in your kitchen would suuuuck. 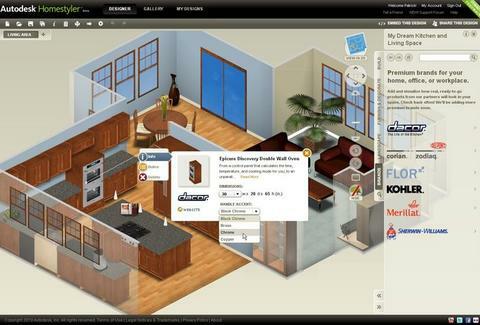 For ultra-realism, you can pimp out your domicile with virtual renderings of real-life products, and even purchase said products directly through the site, which has partnered with brands including Kohler, Dacor, and DuPont, whose products may be a bit swanky for your Duplos duplex.